Understanding and quantifying Greenhouse Gases (GHG) emissions is central to international efforts to slow their growth rate in the atmosphere, in order to mitigate the humanitarian and economic impacts of climate change. This web resource is aimed at PhD students and postdoctoral/early-career researchers working in the natural sciences who want to develop a solid understanding of the role of key greenhouse gases in the Earth system and the processes that govern their dynamics in the atmosphere, ocean and biosphere. Climate change can be seen as one of the biggest environmental challenges for humans for the foreseeable future. Research into greenhouse gases is driven not just by only by scientific curiosity, but also by the practical need to understand their role in the global climate system and mitigate human impacts. Long-term monitoring of the atmosphere is vital in obtaining greater understanding of the processes involved in climate change and ozone depletion. The oceans are a major sink of anthropogenic carbon dioxide (CO2). We need to understand the mechanisms of gas exchange at the air-sea interface and the factors that influence these mechanisms. The presentations in this section discuss the relevant physical, chemical and biological processes in the oceans, the issues and challenges around marine observations and measurements and the changes that the marine carbon cycle has experienced in the past and the present and is expected to see in the near future. 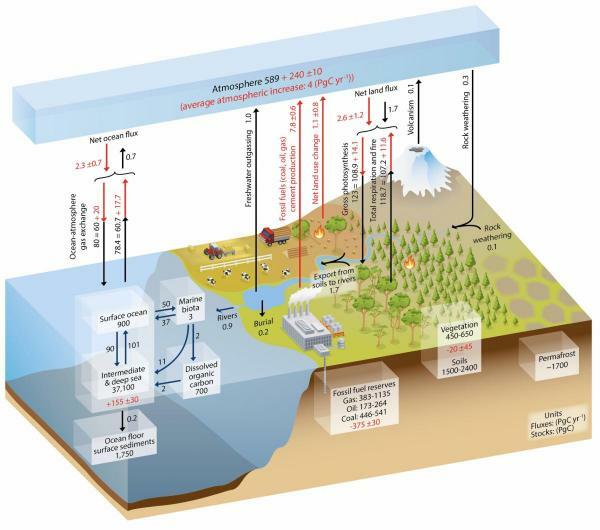 Our most fundamental source of information on the rise of the greenhouse gases in the atmosphere comes from atmospheric monitoring observations of CO2, and CH4. This presentation examines some of the deductions about the carbon cycle that can be made from these observations concerning the natural sources and sinks of CO2 and CH4 and how they are changing with time. For the last two decades, we also have information about the ocean source and sink of atmospheric CO2 from millions of sea surface measurements, further constrain changes in the carbon cycle, especially when combined with atmospheric observations and inversion techniques.